What Are Countertop Dishwashers and How Do They Operate? Advantages of A Countertop Dishwasher. Disadvantages of A Countertop Dishwasher. What To Consider When Buying A Best Countertop Dishwasher? Countertop dishwashers are a perfect example of getting most of everything in a small, compact packages. 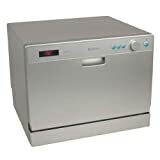 A countertop dishwasher, based on its overall design, is referred to as a compact or portable dishwasher. It has the same features as your standard, full-sized dishwasher although it is smaller in size and can sit on a countertop of any other flat surface. 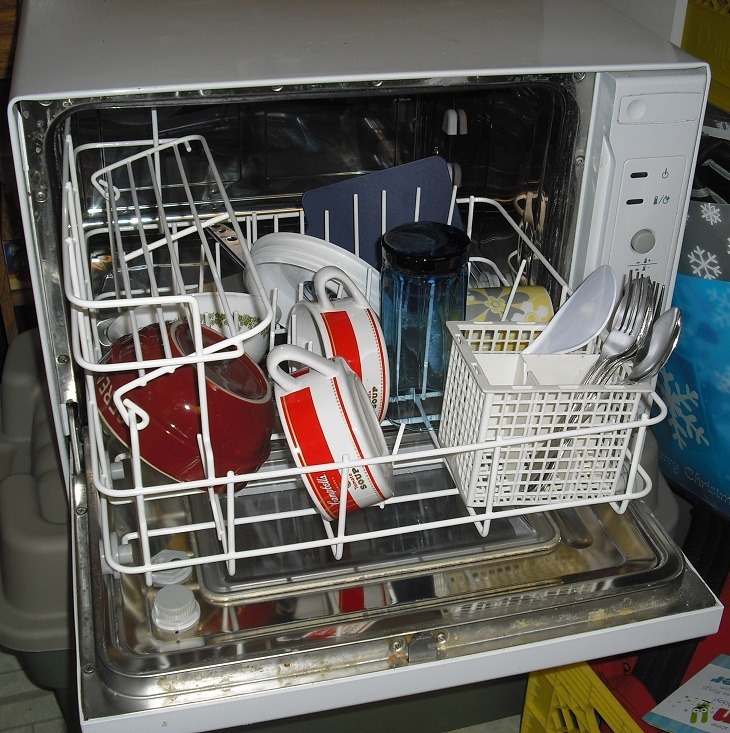 A countertop dishwasher, compared to the full sized dishwashers operate using less energy. It is also portable since it comes in a smaller and more compact size. They can also be easily connected to a sink faucet for water intake. Drainage is quite easy as well with its drain hose feature at the back. Once you have acquired your countertop dishwasher, the first thing you need to do is to find the perfect location for it to be installed. Look for a place which is close to a sink for both its water supply connection and easy drainage. After that, connect your countertop dishwasher to its water supply. This process is already made easy as the unit comes with a hose for you to connect it to a faucet. 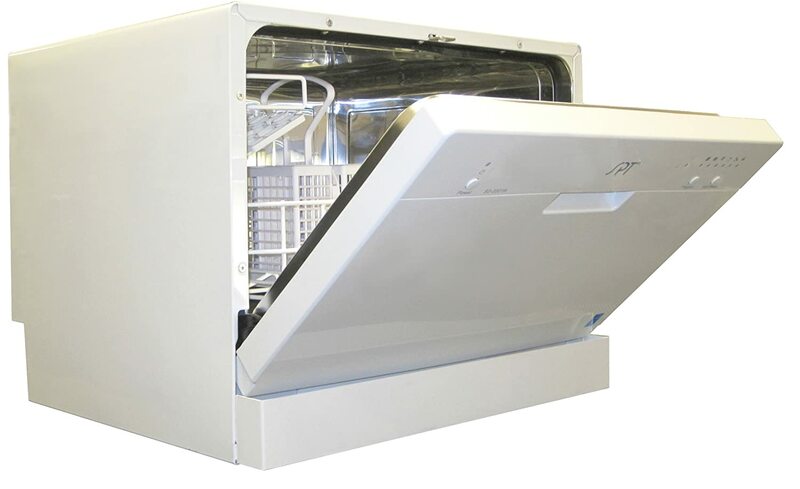 Another thing that comes easy for a countertop dishwasher is the drainage process. Using the drainage hose, you can place it in a drainage standpipe or directly in the sink. With its compact size and portability, the countertop dishwasher makes it easy to install. Not just that, the only thing you need to do is install the inlet hose to a faucet for water supply and the drainage hose to a drainage stand pipe or sink and you are good to go. Anyone can also easily learn how to operate it. Having these features makes the countertop dishwasher a practical and reliable help within the kitchen. Having a limited space in the kitchen is a challenge for anyone. And by just thinking of installing a full-size, the conventional dishwasher can be a problem. However, having a countertop dishwasher may solve this problem. Roughly the size of a microwave oven, it could take up minimal countertop space. This allows you to have more countertop space for other important things around the kitchen. Despite being small in size, its performance when it comes to cleaning does not come shortly. The countertop dishwasher cleans the dishes thoroughly and efficiently. The countertop dishwasher best suits newly-wed couples or individuals living alone in a small apartment. 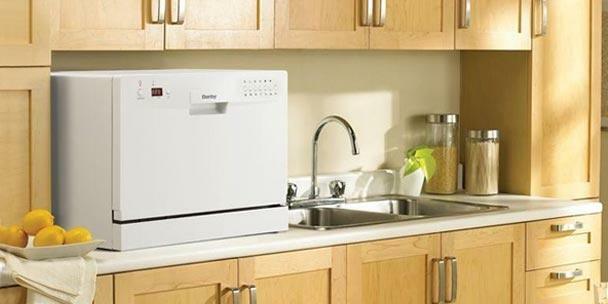 With its compact design and small size, it is no wonder that the countertop dishwasher also uses minimal water supply. This is great news of course since you will be saving money on your water bills. Moreover, it also is energy efficient. Most of the known countertop dishwashers available in the market currently are energy star certified. They allow you to save on your electric bills without sacrificing the quality of performance. Of course, there are not just advantages alone in every kitchen appliance we own. In reality, with a piece of machine that shows great performance, you will also notice a few drawbacks. Here are a few of the disadvantages we’ve found out about the countertop dishwasher. Since it is small in size, the countertop dishwasher may consider it as an advantage. However, there is also a drawback in being small. This offers the limited capacity of dishes that can be loaded. This can be a challenge when having large gatherings in your house wherein there will also be a large number of dirty dishes. Since it only holds a small number of dishes, you have to load it by batches to finish washing everything. Being portable may also have a bit of a disadvantage in the sense of being durable. 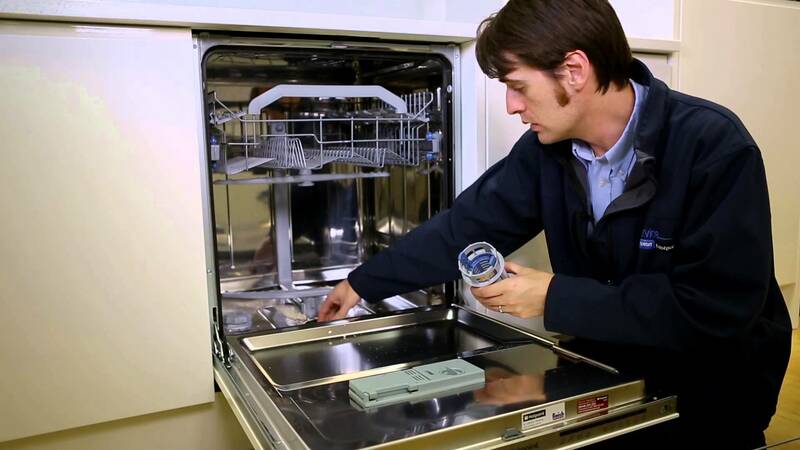 Since a countertop dishwasher can be moved around, having to disconnect and reconnect hoses for water supply and drainage can make the machine vulnerable. Water supply hoses, drainage hoses as well as the power cable must be handled properly as they are prone to damage when the countertop dishwasher is being moved around often. Compared to a built-in dishwashers which usually are within a cabinetry surrounding it that serves as a source of sound insulation, the countertop dishwashers lack this feature. Since they sit freely on a countertop, the noise eventually resounds within the whole room. Having a machine that creates noise can be a bit bothersome for some people. Ultimately, before purchasing a countertop dishwasher, you must be aware of the things you need to consider in finding the best one out there in the market. With the list we have prepared, this aims to help you out in deciding which is the best for you. Before purchasing a countertop dishwasher unit, it is important that you take exact measurements of your countertop space. In doing so, you can choose the right countertop dishwasher unit that will perfectly fit into the countertop space you have allotted for it. Another important thing to consider is the capacity of the countertop dishwasher. This pertains to how much load your dishwasher can hold. 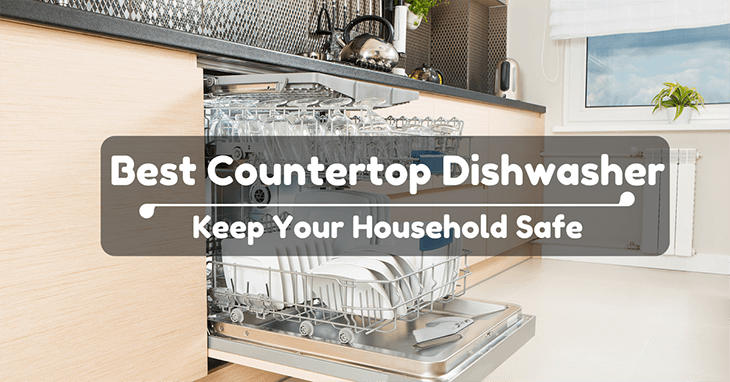 Most countertop dishwashers that are available in the market can hold up to 6 place settings. Having cutlery baskets, dish racks and a cup shelf are also a plus. Moreover, a countertop dishwasher with stainless steel interiors can last longer compared to those with plastic interiors. Of course, this feature is also important to complete the whole cycle of dishwashing. Find a countertop dishwasher that has a dry cycle functionality to it so you can avoid the task of manually drying your dishes. Make sure that the countertop dishwasher unit you are eyeing to purchase has a built-in water heater. This is important especially for heavy dishwashing cycles. A countertop dishwasher with two or more power heating settings is a plus. 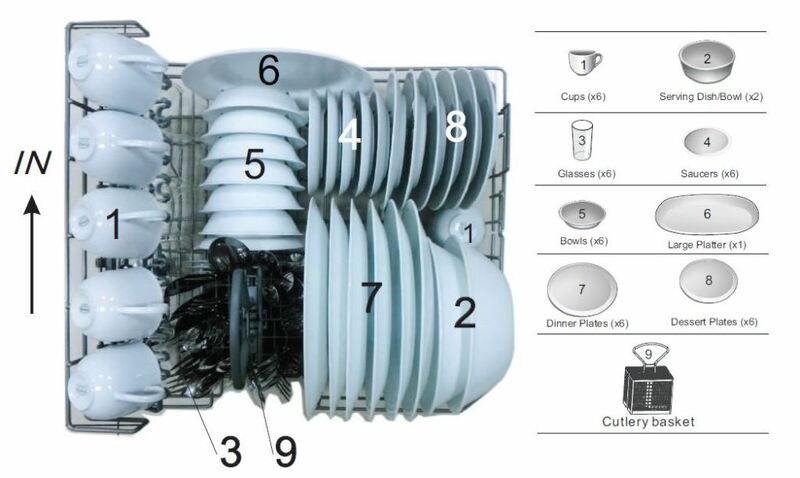 Depending on which model, the number of cycles in a countertop dishwasher unit may also vary. This is important to consider according to your need. 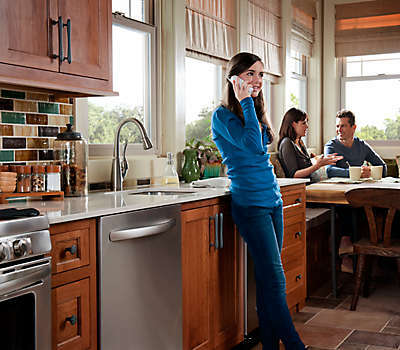 Most countertop dishwashers come in with up to 6 dishwashing cycles. 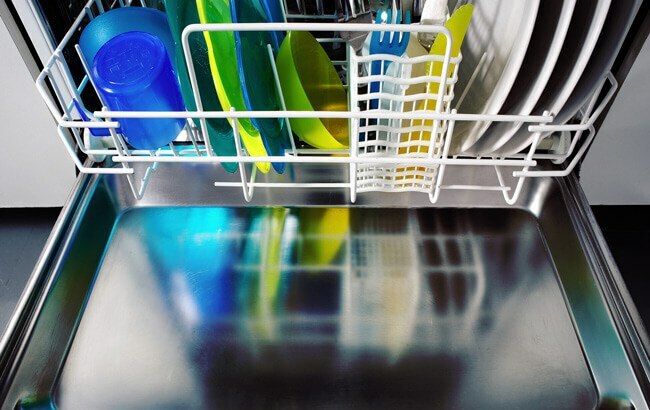 One of the benefits of a countertop dishwasher is that it saves water and uses less energy. This is also an important thing to consider before buying a countertop dishwasher unit. Always check the water usage as well as if the countertop dishwasher unit is energy star certified. 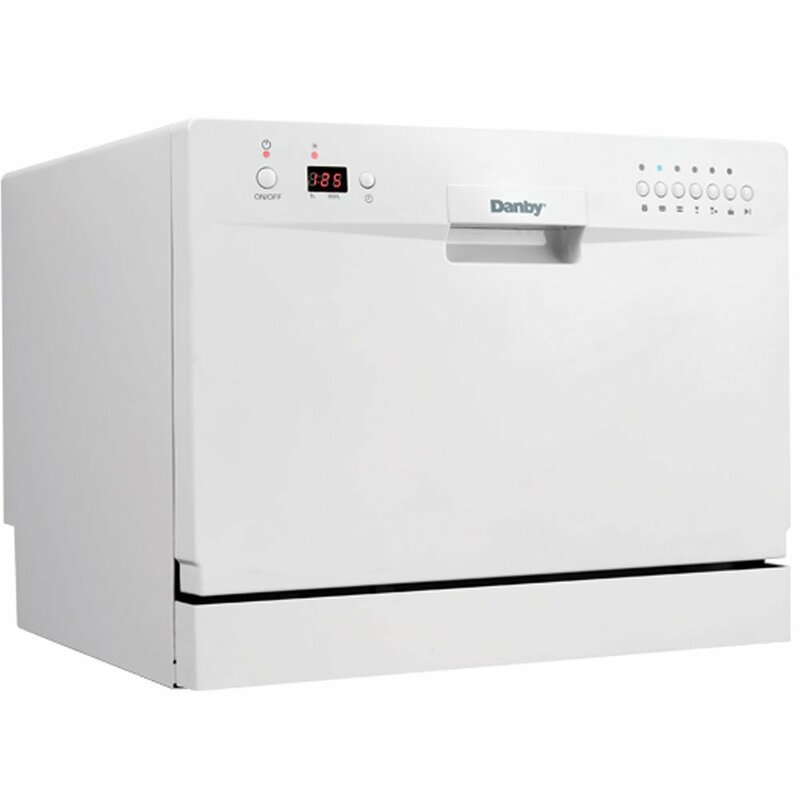 The Danby countertop dishwasher is quick and easy to install due to its compact design. It can hold up to 3.17 gallons of water during a normal wash cycle. It features different wash cycles that include normal, glass, soak, light, heavy and speed. These cycles can be monitored on its LED display screen. It also comes with a 12 months warranty. Its dimensions are 17.25 inches height x 21.63 inches width x 19.69 inches depth and weigh 50 kilograms. It comes with a stainless steel interior that ensures durability. The Danby unit is also energy star certified. 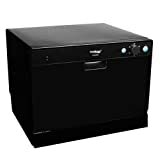 The Koldfront PDW60EW is a countertop dishwasher that is about 17 inches tall, a suitably perfect fit under any cabinetry. This unit uses only 200 kilowatts in a year which makes it very energy efficient. Furthermore, it also consumes less water that will save you money for water bills. This unit can hold up to 6 place settings and also has a cutlery basket and cup shelf. It also has six wash cycles and a built-in rinse agent dispenser. It features a powerful spray arm that cleans dishes with ease and also comes with a stainless steel interior. Lastly, Koldfront has an internal heater system that can heat water up to 149 degrees Fahrenheit which helps eliminate germs and bacteria. Similar to the Koldfront Countertop dishwasher, the EdgeStar 6 also uses only 200 kilowatts in a year thus saving you money on electric bills. It has a compact design that allows it to fits under cabinetry easily. It can hold up to 6 place settings and can wash plates with up to 10.5 inches diameter. It also features a digital control panel and LED display for easy control. In addition to that, it has a child lock feature to avoid accidents from happening. Its stainless steel interior ensures durability and longevity. It has six wash cycles and includes a cutlery basket and a cup shelf. 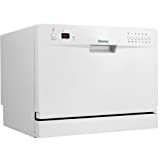 If you are currently living in a small apartment or you have a small kitchen, the SPT SD-2201 Countertop dishwasher is the perfect unit for you. 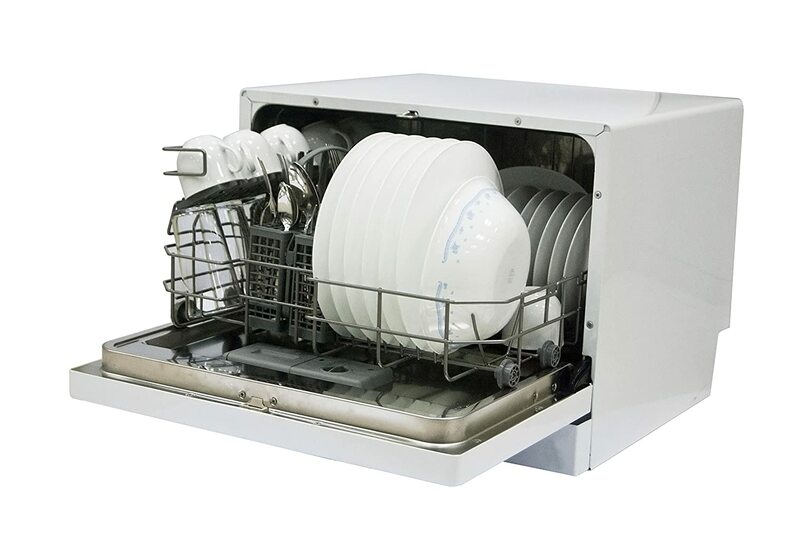 Despite its small size, its manufacturer ensures that its efficiency is that of a full sized dishwasher. Designed with a stainless steel interior, this unit is very durable. It comes with a spray arm for cleaning dishes with ease and also has a dish-rack and a silverware basket. 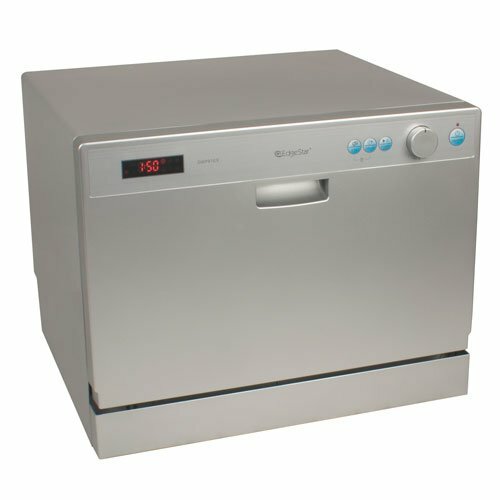 This unit can hold up to 6 place settings and has an automatic detergent and rinse agent dispenser. It has a very user-friendly control system and also its internal heater can heat water up to 148 degrees Fahrenheit. Weighs 49.5 lbs and with a dimension of 21.7 in. W x 20.4 in. D x 17.2 in. H and also includes a one-year warranty; the Magic Chef MCSCD6W3 is also a big contender. It can hold up to 6 place settings and has a cutlery basket and cup shelf. It is user-friendly and easy to install. It also includes an automatic detergent and rinses aid dispenser. Another interesting feature is the anti flood device that gives protection from high water level. Countertop dishwashers are now considered as a must-have in your kitchen. And in these modern times, having kitchen appliances that can make the tasks easier for you works wonders. There are many popular countertop dishwashers available in the market now, and most of them come with very similar functionalities. We’re picking the SPT SD-2201 Countertop dishwasher like the best among other countertop dishwashers. Apart from its water and energy-efficient features, it is a kitchen appliance that not only serves its purpose but also adds value to your household regarding great saves. 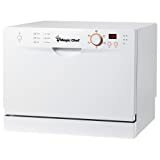 If you have other suggestions for other products that should be included in the list of best countertop dishwashers, please do leave your comments below. We sure hope that this article provided much-needed information that you are looking for. Until then, enjoy your search for the perfect countertop dishwasher.